I am having the same problem I saw on this thread (https://www.cloudyni...vel-what-to-do/ by vkhastro1) but I am not finding the same solution. My 86 year old father has asked me to take over his observatory. Tonight I hefted up his C14 onto the GEM for the first time. The mount is a bit over my head. Whew. I am not sure which C14 model I have but interesting to see it has a Fastar secondary mirror system. The factory focus knob only turns a half turn or so and only serves to move the object around in the view finder. I seem to only have two mirror lock screws with the black thumb knobs and they are loose. There are no apparent obstructions of the main mirror as seen through the corrector. I pulled the rubber focusing knob off, pulled out the end screw and threaded the bearings all the way off. The remaining threaded rod is rock solid, does not budge. Should it move? I would love to find out there are some other mirror locking screws, but I sure do not see any. Thoughts or advice most welcome. The only similar problem I can relate to involved a C8. 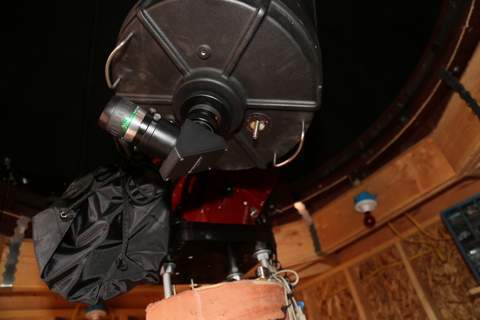 The focus travel moving the primary mirror had been forced and the mirror carriage tube had overridden the retaing circlip and jamming the movement. It was fixed by hand slapping the OTA which released it. Difficult to see that this would happen with a heavy C14 mirror. Had the OTA been stored corrector down for a long period, there is a chance that lubricant has migrated to the front of the shade tube baffle and solidified. It should be possible to push/pull the operating rod by hand. Edited by PETER DREW, 07 May 2018 - 04:22 AM. Probably not applicable here..... but for my C14 Edge I had a similar problem when it first arrived brand new. I called Celestron and they had me totally remove the shipping lock screws, and it freed it up. Good advice. Also make sure the mirror locks are loose. Thanks, Peter, it is helpful to know the operating rod should move. Henry, are there separate mirror locks on a C14? This is not an Edge. At least I think not. Where would the mirror locks be if they were there? I will try pulling the thumbscrews on the back. Seems like they are all the way loose, but then I don't have any other ideas. Do not force anything. If it doesn't move freely, something is wrong. The shipping screws need to be completely removed. If they are still threaded into the mirror slider, that's what is causing your problem. If this scope is a straight C14 or C14 XLT, there are no other mirror locks. Pulling the thumbscrew/mirror locks all the way did not help. All ideas welcome. Hmm, sounds like you do have the Edge, because of the two knobs. It only has two; the focuser screw is at the position of the 3rd knob. Just try manually pushing on the screw, now that you have the focus knob removed, that should tell you if the mirror is stuck. And like John advises, don't force it. It should slide fairly easily. Edited by Exnihilo, 07 May 2018 - 09:32 AM. John- I wonder if I know where the shipping screws are. There are two half inch thumb screws sticking out of the back of the scope. Only the bottom quarter inch is threaded. I have completely removed them from the scope. The reason I ask is that it doesn't appear it would be necessary to take them all the way out. The manual I found suggested leaving them in to plug the hole. So maybe these aren't the shipping screws? What are apparently the shipping screws are all the way. The focusing operating rod is exposed with the bearings off and it is rigidly in place. Not looking forward to wrestling that big bad boy off the mount again. Here are some pics. Notice how far out the operating rod is. Anyone know from looking what model 14" this is? From the photo it appears that the exposed rod is in fact the mirror operating rod. In this situation, the rod on the C8 that I referred to was loose and could be waggled about. It was just the bearings which held it in line when assembled. I still suspect that something previously has been forced. I think you are right, Peter. I am getting ready to haul it down and remove the entire rear assembly. Fools rushing in where angels fear to tread? Edited by Mark Bailey, 07 May 2018 - 10:35 AM. Don't be in a rust to tear it down. If your are positive that no screws in the accessory holes are sticking down in front of the mirror or touching the edge of them mirror (use a flashlight to check this) then here is what I would suggest that you do. Put the focuser assembly back on a few turns but don't put the screws in. 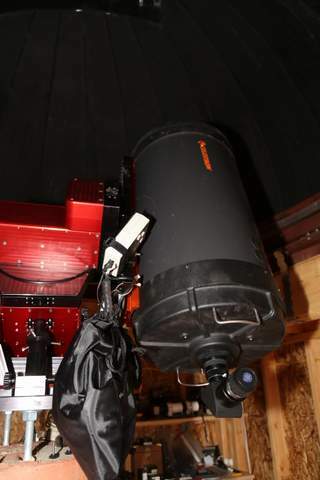 Turn the telescope so that the mirror is pointing down at a slight angle. Maybe 20 to 25 degrees. Now, with the scope pointing down, pull out on the focuser rod, then push in a couple times. If it does not come free, swing the scope so that the other side of the tube is on the bottom and repeat this. There is little in the scope that can jam, but if mirror has not moved for a long time, it might be that it has lost its grease film and is jamming when you try to move it. If it does come free, now you want to move the focuser screw through its full range to re-distribute the grease film on the baffle. The number one reason that an SCT mirror won't move though is that a too long accessory screw is in contact with the mirror. To remove the rear, you basically have to tear down the whole scope. This is because the nuts that hold the rear sell to the tube are not attached to the inside of the tube so they will spin. Mark everything for rotation and if there are spacers at the corrector, take photos so that you can get them back where they belong. If it is a model that has the radial centering screws, only loosen two screws (there will be four). This way, when you re-install the corrector, it will automatically register against the two remaining screws! Thanks, Eddgie. Bummer about those inside nuts. I suspect the lack of grease. The scope was stored for a long time, probably 10 years or more. And it probably got warm in the summers. The only accessory on it is the dovetail plate. I will try backing off all the suspect screws and tilting the scope about with some wiggling. Wish me luck and please stay tuned. I too suspect that the grease film maybe has migrated. The C14 mirror is heavy and if you push up on one side of it the mirror will tilt on the baffle, and if there is no grease, it may simply bind and this is what I suspect has happened. I would try several orientations. Gravity is your friend here. 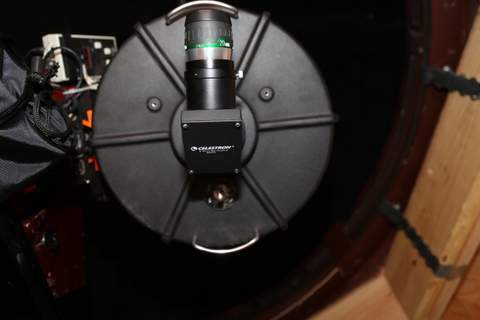 You may also want to point the scope further down, but if you do this, run the focuser assembly in so that the most the mirror can drop is maybe an inch. If this is it, then once you get it moving, go horizontal and see if you can push or pull it along the baffle. Not promising you this is your problem, but there just isn't much else that could have happened.It just about has to be binding due to insufficient grease film. The only thing in the whole scope that moves is the mirror on the baffle and the rod. The rod is not attached to anything else, so logically it would almost have to be the mirror binding on the baffle. No go. Any way to turn up the gravity? Re-inspect the mirror using a flashlight. Look at the secondary baffle through the corrector to see if there is any dent or something. If the mirror is not moving because of a dent or something in the baffle, the front of the carrier should be right up against the deformed area. Also look to see if there is a gap on one side between the mirror carrier and the baffle. It almost has to be something in this area. Look carefully at the baffle an inch before the front of the mirror carrier. Look for anything that might have gotten on the baffle. Look for the retaining ring in the baffle. This ring should be about half way down the baffle. As I recall, this is rubber Oring that runs in a groove. Can you see it? Is a part missing? Inspect carefully. Ok, I would next try this. Turn the focuser assembly so that maybe there is an inch of thread on the focuser rod. Try point the scope straight up, then push/pull the rod. Then, point the scope straight down and and the swing it back and forth though vertical while pushing/pulling. The only thing that holds the mirror in position when the focuser is not screwed in is the baffle. There is nothing else. If the focuser rod is not attached to the focuser, it only attaches to the mirror support. It is not normally touching anything else. The only other possibilites I can think of is that the baffle got damaged due to being dropped or something, or some foreign matter has wedged the carrier against the baffle. The next step would be to pull the corrector and see if you can put your and around the front of the mirror carrier and wiggle/twist there to see if you can free it. Last resort is to take it apart. This is not terribly difficult. Just mark every joint so that you get everything back in the exact same rotational position. 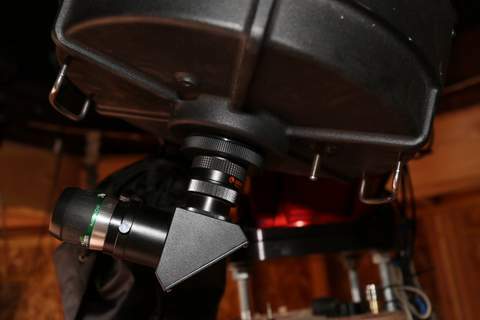 You may also want to try with the scope in perfectly horizontal position on either side of the mount. At this orientation, the mirror carrier should be flat against the baffle rather than being tilted the way it is when the when the scope is pointed up. This tilt causes mirror flop. The focuser rod supports the mirror on holder on one side and it sags down on the other. I can't help with that. If you can see grease on the baffle though, then when you get the mirror to move, you should be able to just re-disribute the grease. This is a very unusual case. I have given you every idea I could think of. If there are no screws intruding into the mirror path or touching the edge of the mirror, there just is not that much left to cause this kind of problem. Waiting to see what the solution to the mystery is. It's a late 1980s early 90s c14. Might need to check for stripped threads on focus bar. Anyhow once the corrector and front casting are off the whole mirror should pull out. Likely something is wrong with the nut that acts as a safety to keep mirror from falling out. If it is screwed in too far could be a problem. Or maybe front mirror clip, also a safety, is pushed too far down and not seated in indentation. Stop lifting tube over your head unless this is on a fork. Is that a Paramount? Eddgie, I truly appreciate your insightful suggestions, thank you. I tried up, down, and sideways. I even used a space heater fan to warm things up at my son's suggestion. Looking in again, yes I can see the o-ring. Everything looks copacetic. The gap between carrier and baffle even seemed to have some shiny grease in it. gnowellsct, got your link and scope ID, thanks! Link even suggests a lube. Now I just need that kid! And yes, it is a Paramount ME. Problem re lifting versus supporting to get it mounted is the height. The bottom of the dovetail is a few inches over my head and the versa-plate does not open up all the way like the mount in the video seems to so the dovetail needs to be slid in not placed and then clamped. Anyway, it is up for now and I think I will try taking the corrector plate off while it is still mounted.